Bob was born at Mystic Park, in northern Victoria, on 12.02.1910. 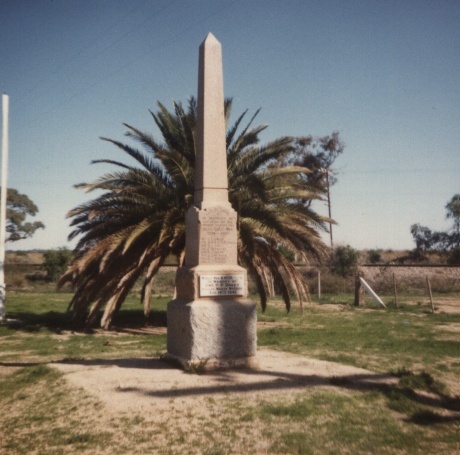 He was the similarly aged Uncle, great mate of Jack “Stump” O’Shea – VX 17217 - who also lived at Mystic Park at the time of his enlistment. Jack William O’Shea had been born at Bendigo, Victoria on 12.10.1913 and they both enlisted at Caulfield Racecourse on 25.05.1940. Bob Davey was Killed in Action, just over a year later, at Mersa Matruh, on 14.08.1941. 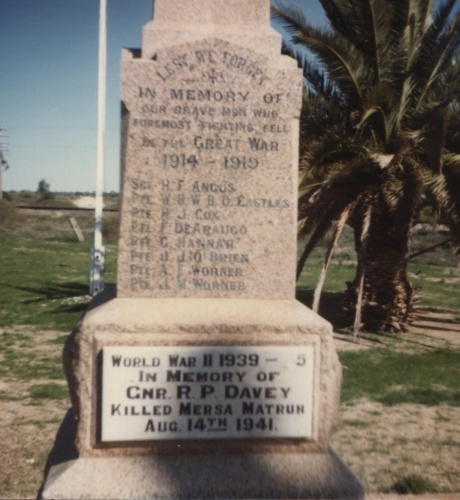 We are fortunate to have found a photograph of his gravesite at Mersa Matruh, and also of the special plaque to his remembrance at the War Memorial Cenotaph at Mystic Park. 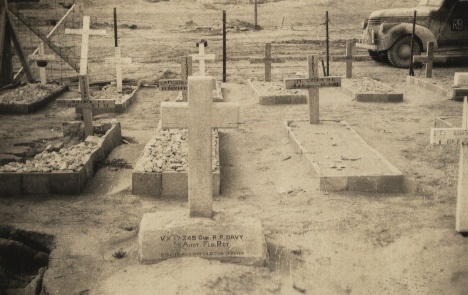 Gravestone of Bob Davey at Mersa Matruh. Mystic Park memorial showing closeup of his plaque. "Bob Davey as listed on the website was killed in action at Mersa Matruh 14-08-1941. Actually the correct terminology of his death should be listed as Killed On Active Service as we were not in action at the time, but engaged in building up Matruhs Fortress defenses & as such, subject to enemy activity eg. Air Raids. Having only lost one man to enemy action at Matruh, there seems no doubt, that this was Bob Davey. I was not aware of his name at the time of his death, even though I witnessed the unearthing of his body minutes after the explosion. Severel men quickly gathered at the site & worked like beavers to unearth his body, he was pronounced as dead by the Regimental Medical Officer. Early that evening I seem to recall a chappie asking Alan Kinghorn & myself whether the dug out adjoining ours was vacant, we replied in the affirmative, he also mentioned he had just returned from leave & as his battery was away on manoeuvres he would sleep the night there & make it to his own lines next day." 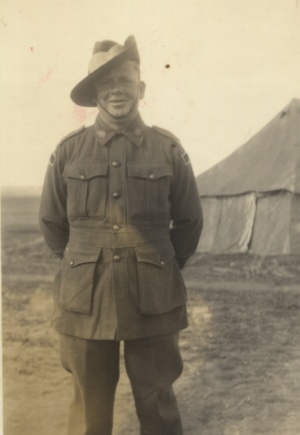 "Leave to Cairo came to eight members of the battery as recommended by our medical officer, and a close friend, Alan Kinghorn and I were amongst them. As the Battery was out on manoevres, few troops were left in the lines, so I suggested to Alan that as we had an early start in the morning he should bring his gear up into my dugout and sleep the night there. So, with Cairo leave about to start the following morning, we settled down on our bunks, hopefully to rest. The Germans thought otherwise, as the planes were over our position around midnight and for the first time a stick of 250 pound bombs landed right on our position. Both Alan and I lying on our backs in our bunks had only seconds to realize from the noise of the falling projectiles that they would be close. Bombs from the air have two distinct sounds. One is a whistling sound, which indicates it will be reasonably close to you. The second is like the sound of a steam engine letting off steam, telling you this one has your name on it. As it happened, this 250 pound bomb penetrated and went deep into the soft sand approximately three feet from the corner of the dugout. In fact we later took a measurement that showed it penetrated eight feet from our shocked bodies. The fact that it penetrated into deep soft sand before exploding saved both our lives. The explosion was huge and lit up our dugout like day, gear and weapons tossed about and both of us ejected from our prone positions, dust and smoke making breathing difficult. It was a miracle how we both survived and were uninjured, apart from shock and the effect of the blast. We quickly vacated our premises to join several men to ascertain the actual damage. Unfortunately another soldier, having returned from leave that evening, had decided to use the empty dugout adjoining ours, rather than find his own some distance away. He was buried by the explosion and died instantly. It was several minutes before digging away the sand revealed his body, with not a mark on it. Such is the luck of warfare or fate, whichever way one looks at it. On the face of things, we considered it be be an ideal time to have Cairo leave!"